Ever wondered how our events get put together? Or what our ultimate hospitality experience would be? Well read on to find out more about what our Events Coordinator Cassie Hickmott does on a day-to-day basis as we Meet The Team. I assist with event coordination and operations. So the main job I do is send out guest packs and event documentation, I will also deal with a lot of customer queries and find out more information about the event for them. You work behind the scenes on a lot of our events, can you give us an insight to what it is like in the lead up to an event day? It’s very busy, it takes a lot of planning and orchestrating to make sure that everything comes together at the right time. You need to make sure the customers have everything they need before they go to the event and deal with any last-minute requests. Out of all the events that we do, which one would you recommend as the ultimate luxury experience? I would say the horse racing hospitality, probably Royal Ascot corporate events. I would also say the Henley Royal Regatta is an amazing experience. They are both synonymous with luxury and elegance, you get the chance to dress up, enjoy the summer sun and have a few glasses of Pimms, which makes for a great day out. Thinking of our events, which ones would you like to experience hospitality at? I would love to go to Goodwood Revival, I love the old military forties and fifties style so I think the event just looks amazing, it’s like going back in time looking at all the vintage cars. The hospitality at Goodwood looks fantastic and the Festival of Speed is also another event that is a really unique hospitality experience. Do we have any events on offer that provide something a bit different for the customer? The events we have at Royal Albert Hall are always a bit different and they provide a unique experience. There is always an array of concerts going on there and you will get some great shows like Cirque Du Soleil. With The Green Room moving for Twickenham to Cheltenham, which elements of the suite do you think will work well at the festival? 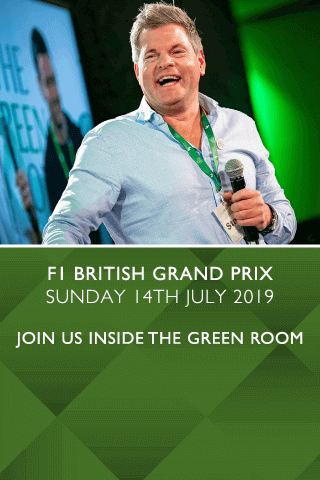 The interaction with the celebrities, that is one of the highlights of The Green Room, getting the chance to meet these people in a relaxed environment and just have a chat with them. A lot of the time you will meet your idols, whether you are at a rugby event or horse racing you are going to see some true greats of the sport, and it’s great to have the ambassadors Lawrence Dallaglio and Mike Tindall, its makes it a money can’t buy experience.